Chances are you have had an influential leader or mentor over your career who has provided good advice, thoughts on changing jobs, how to work on being promoted, or ways to approach a difficult situation. These people tend to be relevant in the moment and serve a singular purpose, but do you have an inner circle “team” or a few individuals who can inspire, give critical feedback, can open up their network to you, or challenge you to grow beyond your own comfort zone? Jordan Spieth is a very famous 22-year old professional golfer and has grown to great heights in a short period of time. He is a perfect example of having a professional “inner circle” or team of supporters that balance inspiration with personal fitness, wellness with management consulting and leadership, and wealth management with philanthropy advice. Needless to say, Jordan’s golf coach Cameron McCormick works on different areas of Jordan’s game than his clothing and outfitting provider, Under Armor. His equipment sponsor Titleist is going to ensure his clubs and balls for tournaments are tuned and available, and yet they also watch him to ensure he is performing up to the Titleist brand and continues to win so they can sell more products. So my challenge to you is this. Who do you have in your inner circle? If you don’t have one, find one or two people who are invested in you and willing to work with you. 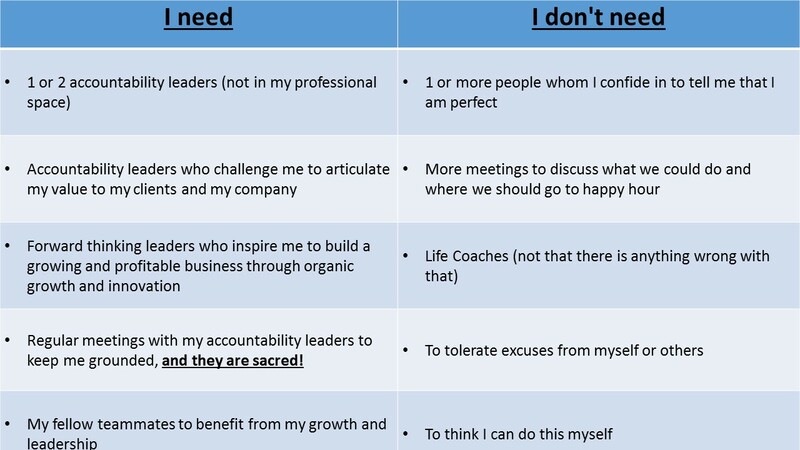 If you have one already, then make sure you have your list of “I needs” and “I don’t needs” figured out so you can ensure you have the right outcomes defined for you. And if your current situation isn’t working for you, change it out.